Courtesy of Alliance Realty Group of the P.
A MUST SEE! THIS IS A SPACIOUS UPGRADED VILLA IN THE HIGHLY SOUGHT AFTER TIMBERWALK OF LOGGERS RUN COMMUNITY. THIS UNIT HAS AVERY LARGE ENCLOSED PATIO, COURTYARD ENTRANCE.. AS YOU ENTER THROUGH THE FRONT DOOR YOU WILL NOTICE VAULTED CEILINGS AND SKYLIGHTS GIVING THE HOME A LIGHT BRIGHT OPEN FEELING. THE EAT IN KITCHEN IS LARGE WITH UPGRADED WOOD CABINETS AND CORIAN COUNTER TOPS WITH PLENTY OF CABINET SPACE. THE MASTER BEDROOM HAS FRENCH DOORS WHICH LEAD TO COURTYARD PATIO. THE MASTER BATH HAS BEEN COMPLETELY REMODELED WITH DESIGNER FEATURES. THE 2ND BEDROOM IS ALSO VERY SPACIOUS. THE 3RD BEDROOM WAS MADE FROM PART OF THE ENCLOSED ROOFED PATIO. IT IS LARGE WITH IT’S OWN PORTABLE A/C UNIT, LARGE CLOSET AND VANITY SINK. THIS HOME IS WELL KEPT RECENTLY PAINTED AND READY FOR NEW OWNERS! 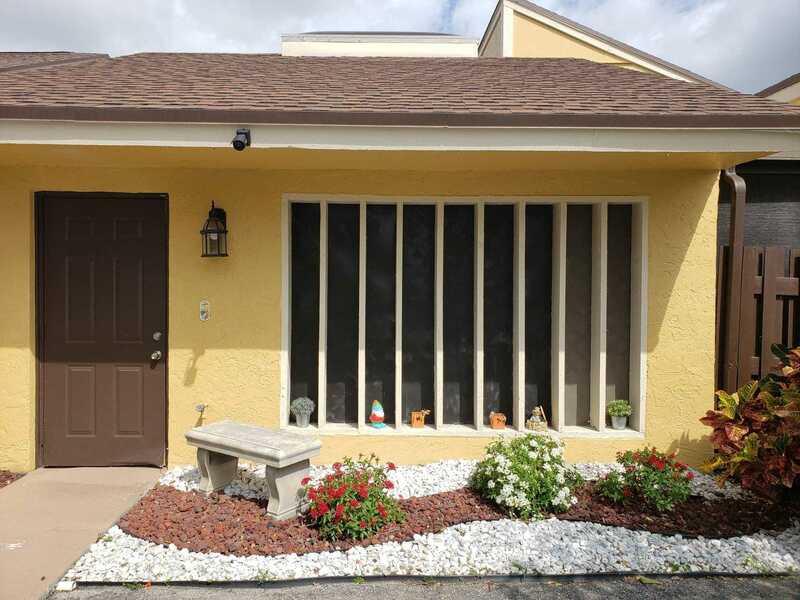 Please, send me more information on this property: MLS# RX-10521880 – $245,900 – 22636 Vistawood Way, Boca Raton, FL 33428. I would like to schedule a showing appointment for this property: MLS# RX-10521880 – $245,900 – 22636 Vistawood Way, Boca Raton, FL 33428.